sundays are my favorite. minus the “i soon must go back to the office” anxiety, sundays are made for relaxation and culinary creations that take more time than what i can spend during the week. 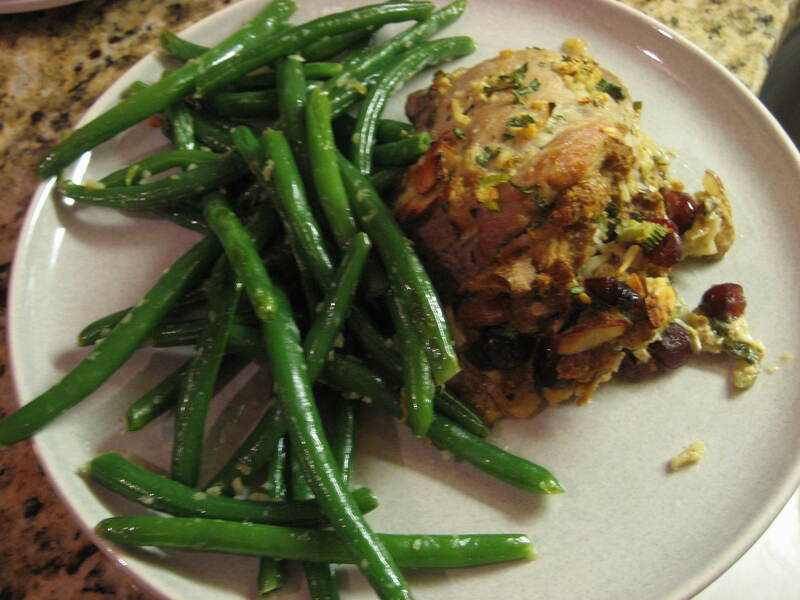 this sunday was devoted to savory stuffed pork chops and garlic green beans. now, this pork chop recipe was borrowed from a cookbook of admittedly odd origins. when i was in college, i bought a toaster. it came with a cookbook. 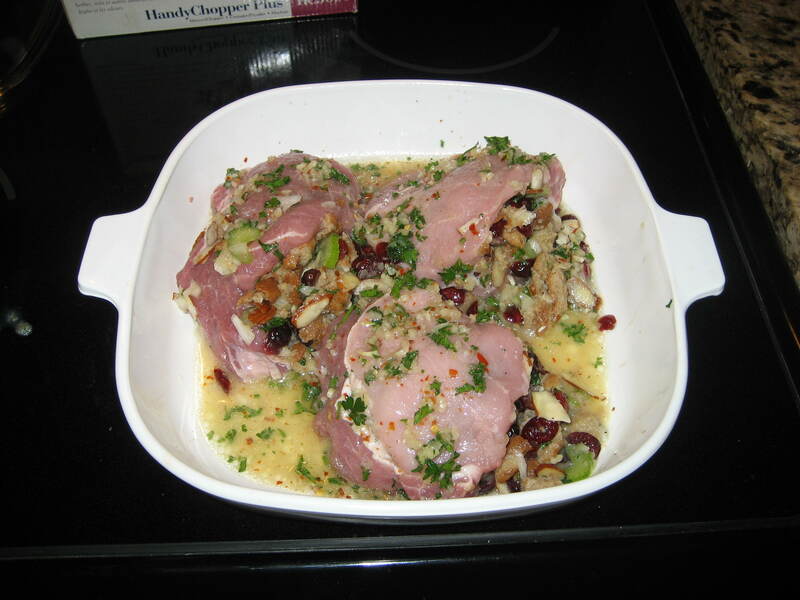 the cookbook contained recipes for basically any and every kitchen gadget created by oster, hence the recipe for savory stuffed pork chops that clearly cannot be made in the toaster. p.s. the toaster has long since ceased operations, while these recipes just keep going and going. there’s a lesson in there, somewhere. so i’ll figure this out as i go, but this time, i’ll start by sharing the recipe. okay, so a couple of notes on the ingredients list. 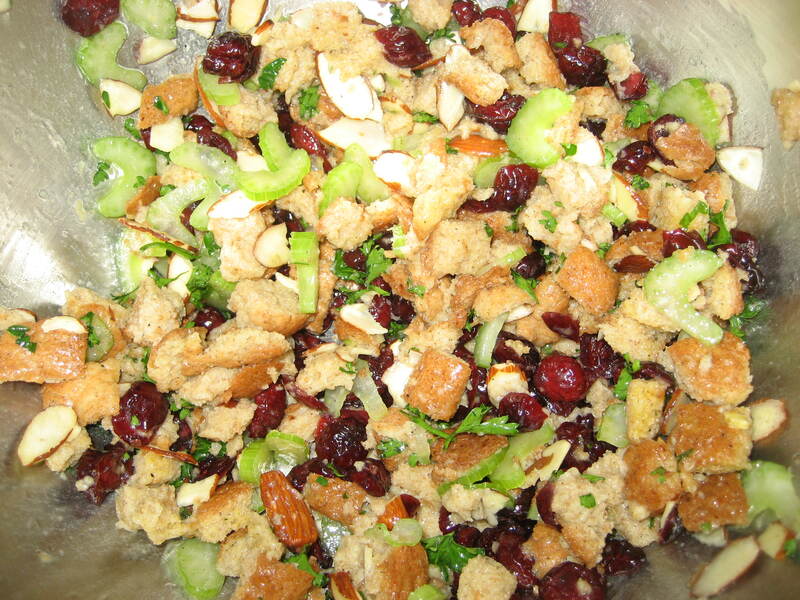 i’ve found that this recipe is best with everything bagels used for the bread cubes. trust me on this, i’ve used everything from light wheat bread to dried italian, and everything bagels are the way to go. also, the red pepper flakes are kind of optional. they do add a spicy kick, which seems a little odd with this dish but personally, i love it. BUT if you are anti-hotness (you fool) then leave it out, cause it’s spicy. and i’ve tried this recipe with calvados, cognac, brandy AND apple juice, and believe it or not, alcohol lover that i am, i prefer the apple juice to the rest. bake at 350 degrees for about one hour. i decided to make garlic green beans with this. now, i have my own way of making these, but i will admit it’s not quite right just yet. i used to eat fried string beans at a tiny, hole in the wall chinese restaurant in philadelphia (empress garden, for my philly friends) and i obsess over trying to re-create their recipe. so far, i’ve been completely unsuccessful. so if anyone has suggestions, please do help me out. 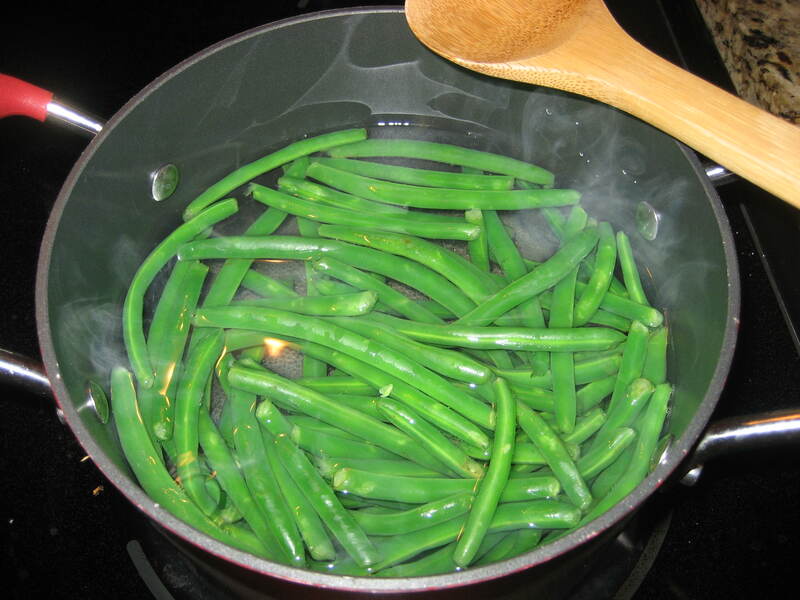 in any case, i make the string beans by boiling them for a couple of minutes, til they’re tender-crisp. i love string beans for a couple of reasons. one, because snapping off the ends reminds me of sitting on the porch swing with my ma and snapping beans, which at the time was a necessary evil to be granted permission to actually do something fun. now, i just miss it. and TWO, because i love how when you throw them in the boiling water, they turn so bright green. the reason for this is to stop them from continuing to cook. 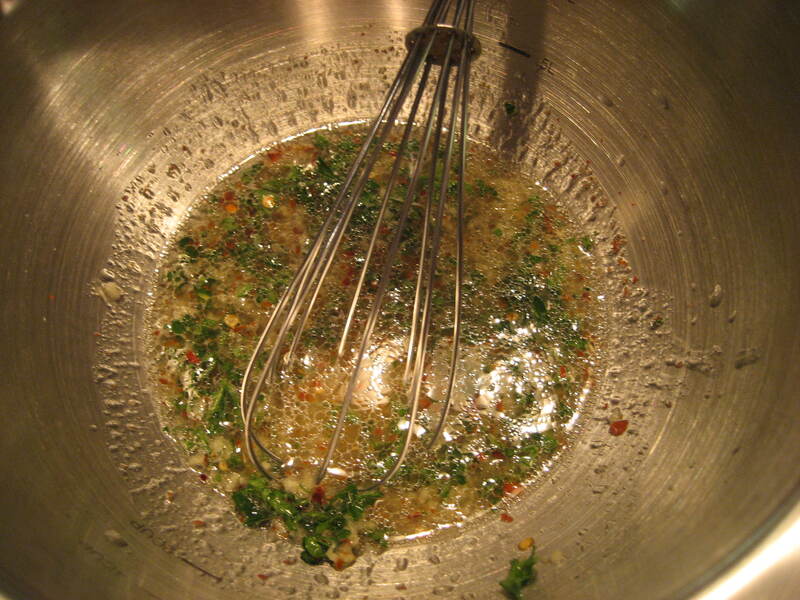 it brings the temp down quickly, allowing you to pan-fry them without them turning to mush. right before i toss them into the ice bath, i make sure i have a pan heated on the stovetop, with some melted butter. i toss in some garlic – probably two tablespoons, to be honest, i LOVE garlic – and allow the garlic to brown a bit while i’m doing the ice bath. 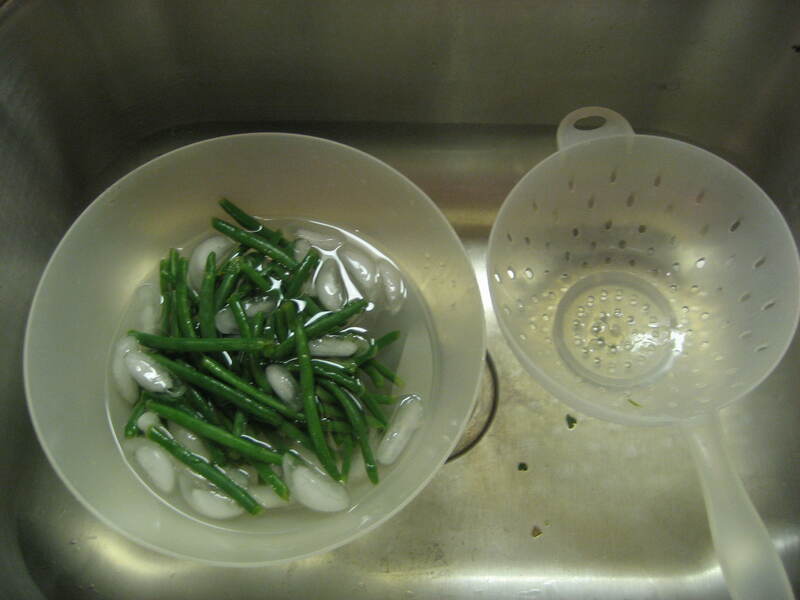 then, remove the beans from the ice and add to the pan with the garlic. cook for a few minutes and serve.